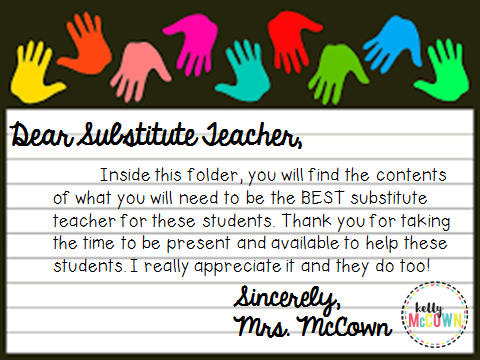 Are you prepared to have a substitute enter your classroom this school year? Substitutes are usually visitors that may not have stepped in your classroom before. The easiest way to make them feel WELCOME is to have a folder prepared with the essentials for the day. You can prepare this ahead of time (3 months or the day before), but make sure it's all in one easy to read spot. 1. A pen and some pencils for them to hand out to students who forget theirs. (Also don't expect to get them back). 3. A list of the students and where they sit in the classroom. Also you can put a star by a few names of responsible students for the substitute to get help from. 4. A Simple EASY lesson plan template for ANY substitute to read and make comments on. You may not know WHO your substitute is ahead of time and the best practice is to KEEP IT SIMPLE. I have had principals, yes multiple principals rave about how much they LOVED my EASY to read lesson plan template. Make sure you download this Editable FREE lesson plan template too. You won't regret it because it's FREE! 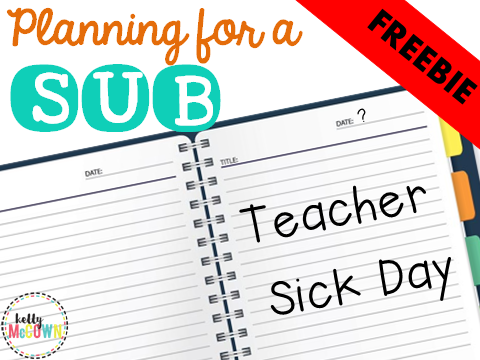 I hope these four easy steps help you & your substitute teacher on your next sick day! 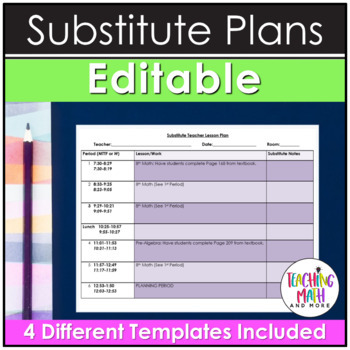 If this Substitute Lesson template was helpful in any way please leave me a comment on the product in my TPT store. Cheers to good health until then!